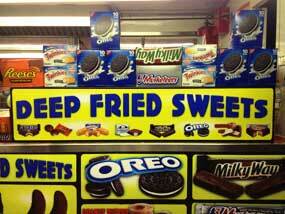 We had hoped to find a single mathematical equation capable of calculating the caloric effects of deep-frying. It was not for a lack of research that we failed. It turns out that the amount of oil absorbed in frying depends heavily on the texture of the food be fried, the type of oil used and temperature of the oil. The best we can do is set a range: Dense foods that absorb little oil increase in calories by around 50%. Foods that emerge from a fryer like a crispy sponge dripping with grease will have more than doubled in calories. We recognize that our answer is too broad to survive scientific peer review. Without purchasing a Bomb Calorimeter, this is the best we can do with the available data. Which leads to even more perplexing question: why is there so little information available on the caloric implications of deep-frying? If you Google “How many calories does deep-frying add?” you will find hundreds of entries purporting to answer the question. Unfortunately, we found them all lacking. Most of these sites offer no useful information at all; they exist for the sole purpose of search engine optimization and read as though someone vomited keywords onto a page. The rest are either shockingly misleading or uselessly vague. Some of the calorie numbers we came across on poplar diet sites appear to have been generated by rolling 100-sided Dungeons & Dragons dice; they did not even tie to the numbers we found in those site’s own calorie counting databases. Fact: There is one possible, conspiracy-riddled, paranoid explanation for why so little useful information has been written on the subject of the calories added by deep-frying. Perhaps the Frito-Lay Corporation has a paramilitary wing that has been shockingly effective at silencing critics of fried foods. Somewhere in the Midwest there may be a labor camp/potato farm modeled on North Korea where critics of frying are spirited during the night and forced to grow tubers under subhuman conditions. No problem, we thought. We went to college. We can do our own research. How hard can it be to look up the calories in foods before and after frying? Once we have those raw numbers, the magic of grade school-level math will provide our answer. It turned out not to be so easy. We had previously noticed that calorie counters—both online and in book form—often disagree on calorie counts. Only when we started collecting these numbers in a spreadsheet did we realized that calorie measurements vary so frequently and so widely as to appear completely arbitrary. In the end, we turned to the USDA for help. We have had our differences with the Department of Agriculture. In the past, we blamed their Food Pyramid for the obesity epidemic. In this case, however, we were not looking for opinions or recommendations. All we needed was raw data. For that we went to the USDA National Nutrient Database for Standard Reference. Before We Lay Out Our Results: It is worth mentioning that the USDA database lacks some very important information about their calorie experiments. They do not state what type of oil was used or at what temperature the frying was done. They also make a few odd choices in their descriptions. They list “breaded” separately from “battered” but make no attempt to explain the difference between the two. ​ Dense foods that absorb very little oil still gain over 50% more calories when they are deep-fried. For example, if you take a raw chicken breast and toss it naked into a fryer, you increase the calories by 64%. This is far higher than we would have imagined. Anyone who has marinated chicken breast can attest to the fact that they don’t absorb much liquid. Nonetheless, they clearly absorb enough oil to add a ton of calories. Additional Chicken Facts: If you batter that same chicken breast before frying it, the calories more than double (a 128% increase, to be exact). If you then pick the batter off that piece of fried chicken the calories are only 33% high than pre-battering and frying. Apparently, picking off the batter eliminates most of the frying-added calories. If you are stuck eating fried chicken, this is useful information. More porous foods absorb more calories from frying. The calories in corn tortillas, for example, increase by 124% as they are transformed into corn chips. Potatoes tell a similar story. Turning a raw potato into a packet of McDonalds fries represents a caloric increase of 368%. Additional Potato Facts: Before we are accused of being deceptive, turning a potato into a packet of fries is a two-step process. Each step more than doubles the calories. First, potatoes are processed into what the USDA refers to as, “Potatoes, french fried, all types, salt added in processing, frozen, unprepared” This process increases the calories by 113%. Some of this increase likely comes from the removal of the skin. The rest of the increase must be due to “processing,” which is both unexplained and impressively caloric. The USDA did not test fried potatoes, so we used McDonalds fries for our comparative analysis. Turning frozen processed potatoes into golden brown french fries increases the calories by an additional 120%. Sadly, we did not find good numbers for potatoes cut and fried at home. But, assuming you do not remove the skin or do anything else that entails “processing,” you can safely assume that calories will more than double. Here are the calorie numbers we used in convenient, table form. Feel free to check our math or try your hand at building a mathematical model of the calories added by deep-frying. If you pull it off, we will personally lobby the Nobel Committee on your behalf. We will hold your drink while you go up to the podium to collect your prize. And, if the Frito-Lay Corporation manages to get ahold of you, we will send Dennis Rodman.